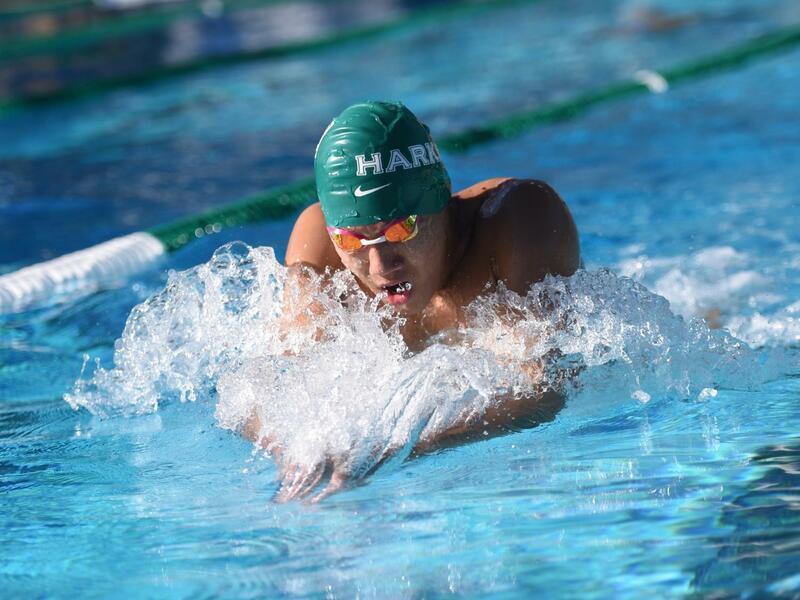 Andrew Chang (10) swims during the swim meet on Thursday. Matthew placed first in the 200 meter and 500 meter freestyle. 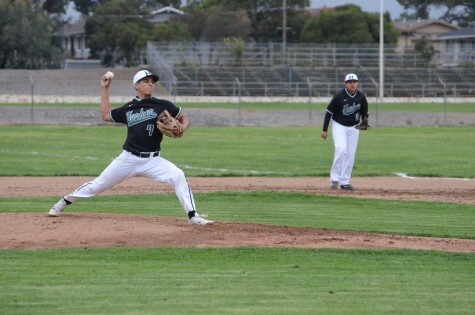 After a 6-1 loss against Jefferson High School on Tuesday, Mar 12, the varsity baseball team defeated Crystal Springs Uplands 7-6 in their first league win, increasing their record to 1-1. 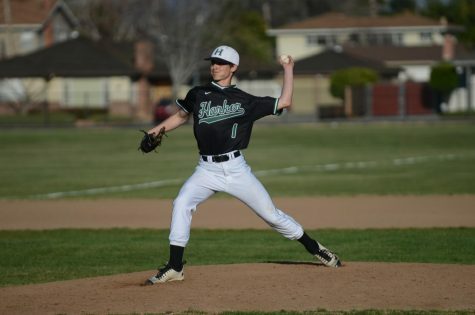 Despite the team giving up six unearned runs in the second inning, freshman Mark Hu pitched six innings, giving up only six hits, and Max Lee (11) hit a clutch triple, tying the game at 6-6 before Ian Williamson (10) hit a walk-off single with two outs in the seventh inning, winning the game for the team. 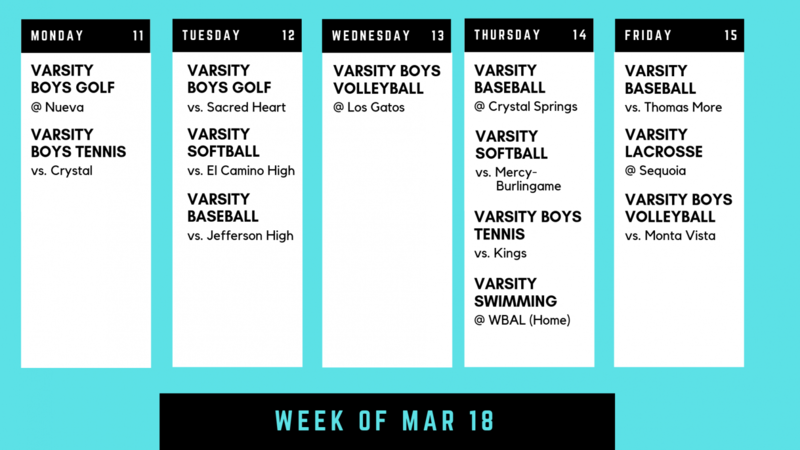 The team next hosts Jefferson High School again on Mar 19 at 4:00 p.m. 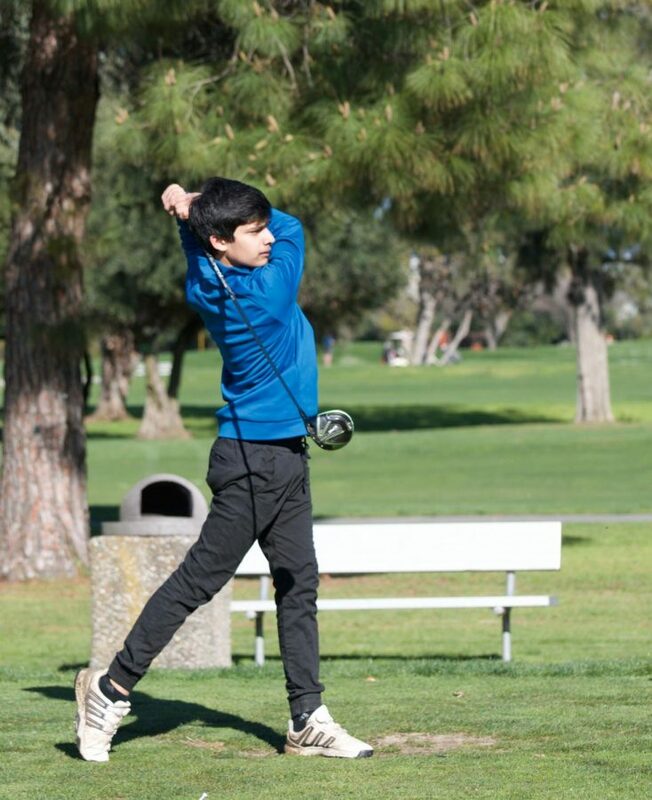 The varsity golf team lost 206-196 to Menlo on Tuesday after a very close game, their first loss of the season. 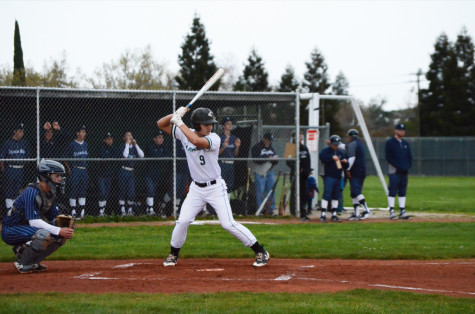 Although they had planned to play King’s Academy on Monday, their opponents forfeited due to lack of players, and the team’s game on Friday against Granite Bay High School was canceled. Despite these setbacks, the boys look forward to their upcoming match against Nueva on Monday, Mar 18. Aditya Tadimeti (10) watches on after driving the ball. After the King's Academy forfeited their match on Tuesday, the boys practiced on their own. 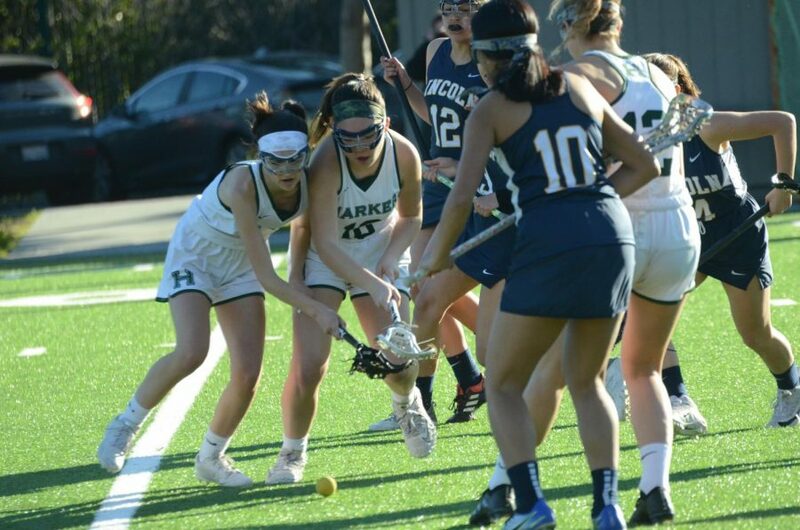 The girls varsity lacrosse team beat Lincoln High School 13-7 on Wednesday, winning their fifth preseason game this year and raising their overall record to 3-2. Highlights include Callie Mayer (12), Elise Mayer (12), Piper White (11) and Heidi Zhang (12) all scoring goals, and Naviya Kapadia (11) playing her first game as goalie. Defender Emma Andrews (10) acknowledged the challenges the girls faced, with almost the whole team being injured and sick, and how the team hopes to overcome that in the future. The girls next play away against Sequoia on Mar 22. Zoe Sanders (10) and Callie Mayer (9) look to pick up the ground ball during the lacrosse team’s game against Lincoln High School on Wednesday, Mar 13. The girls currently maintains an overall record of 3-2. 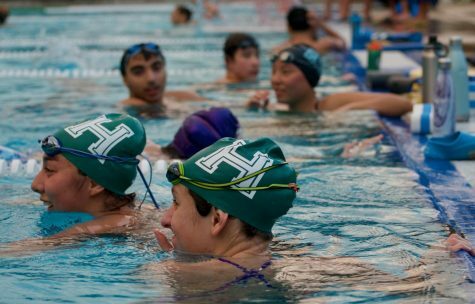 On Thursday, Mar 14, the swimming team hosted the WBAL Jamboree, competing against Crystal Springs, Notre Dame-SJ and Notre Dame-Belmont. The boys relay team of Matthew Chung (10), Rhys Edwards (10), Ethan Hu (11) and Alex Yu (12) won the 400-meter freestyle event and qualified for CCS. Matthew, Rhys, and Ethan also made the CCS cut times in their individual races, with Matthew placing first in the 200-meter and 500-meter freestyle, Rhys in the boys 100-meter freestyle and 100-meter backstroke, and Ethan in the 200-meter individual medley and the 100-meter breastroke. Additionally, freshmen Nikela Hulton and Ysabel Chen won their events in the 100-meter butterfly and 100-meter freestyle, respectively. After this strong performance, the team continues to prepare for their upcoming meet on Thursday, Mar 21. The varsity tennis team played a strong game this week, winning all three of their matches and increasing their league record to 5-1: they beat King’s Academy 6-1 on Monday, Pinewood 6-1 on Tuesday and Crystal Springs Uplands 5-2 on Thursday. 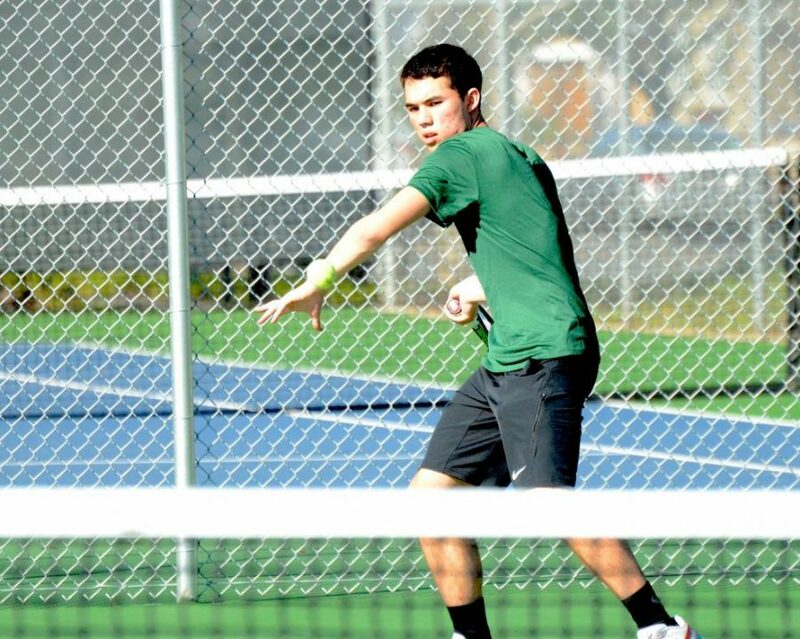 The boys host Crystal Springs Uplands again on Monday, Mar 18, at 4:15 p.m. 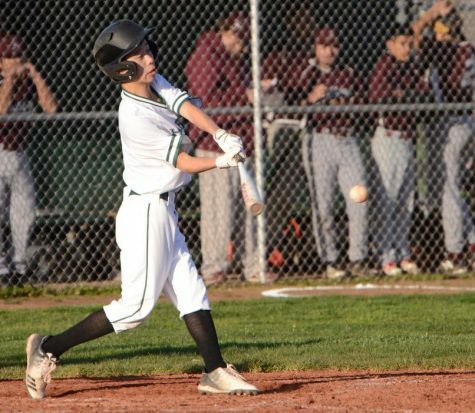 The junior varsity team also performed well in their three games, beating Sacred Heart Preparatory School 7-0 and 6-1, respectively, on Tuesday and Friday, and Crystal Springs Uplands 5-2 on Thursday. They again play Crystal Springs Uplands on Mar 18. Kai Franz (12) returns the ball during the match against Kings on Monday. Their overall record now stands at 4-1. The track and field team competed in their first league meet of the year on Wednesday, earning recognition in a variety of events. 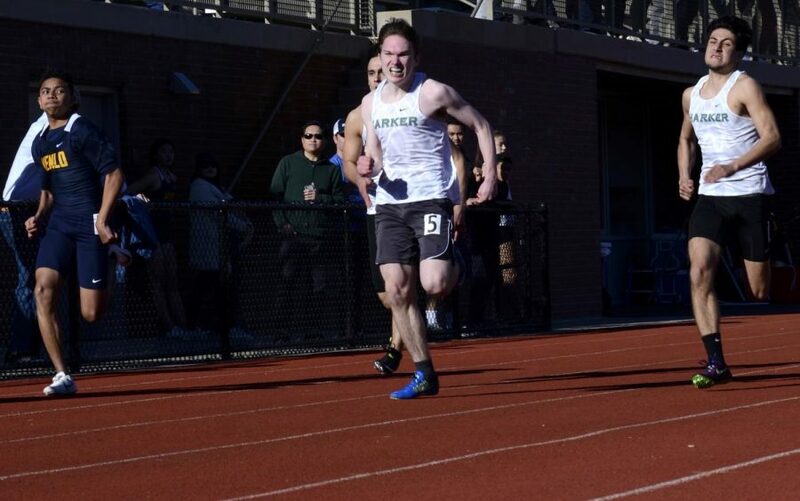 The 400-meter relay team of Andrew Chen (9), Mitchell Granados (12), Anton Novikov (10) and Giovanni Rofa (11) won their race, as Anton took second in the 100-meter and 200-meter individual events. Freshman Alexa Lowe placed first in the 800-meter. Additionally, Natasha Matta (9) won her two hurdle competitions; Alexa came within one foot of the school record in her first triple jump of the year. Thrower Ayush Vyas (12) took the win for both the shot put and the discus throw. The team next competes at the St. Francis Invitational Track Meet on Saturday, Mar 16. Anton Novikov (10), Mitchell Granados (12) and Giovanni Rofa (11) run in the first heat of the 100 meter dash. 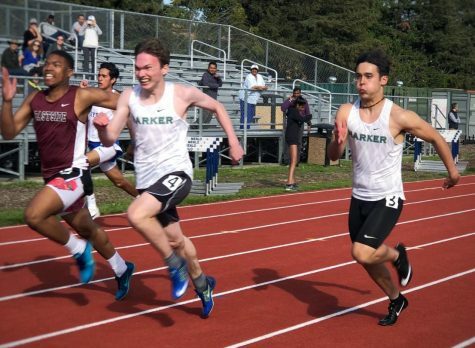 Anton placed second in the 100 meter with a time of 11.96 seconds, and the team of Anton, Giovanni, Mitchell and Andrew Chen (09) placed first in the 4x100 relay. The varsity volleyball team maintains their undefeated league record this season, defeating Saratoga High School on Wednesday in three sets to make it 7-0. 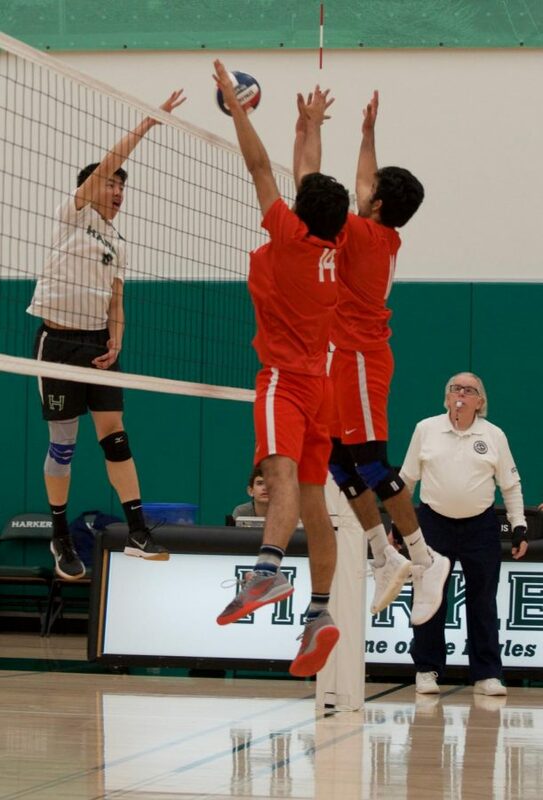 The boys also placed fifth at the Best of the West Invitational in San Diego last weekend, despite initially being seeded 30th out of some of the top 32 teams on the west coast. 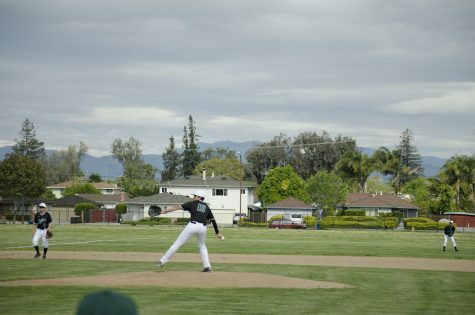 They went 5-1, even defeating local rival Monta Vista High School before finally losing to Palisades. 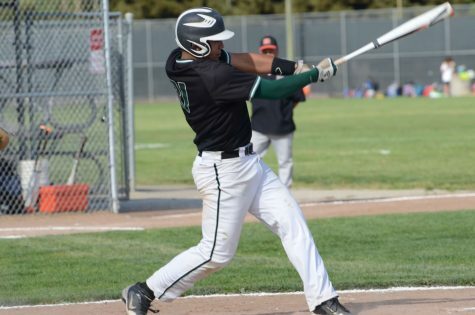 The team next will play against Los Gatos High School on Mar 20 at 6:45 p.m., following the junior varsity team’s game at 5:30. Jeffrey Kwan (11) tips the ball to tool the block against Saratoga High. "I think we’re fairly strong offensively but defensively we have some issues. 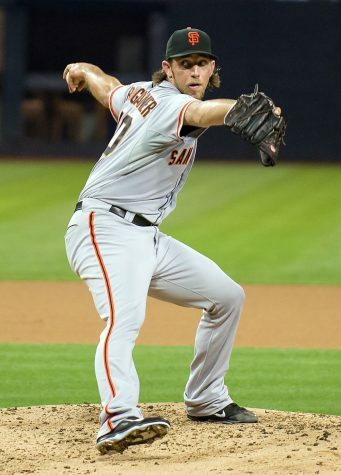 We can also work offensively more through the middle," Jeffrey said. 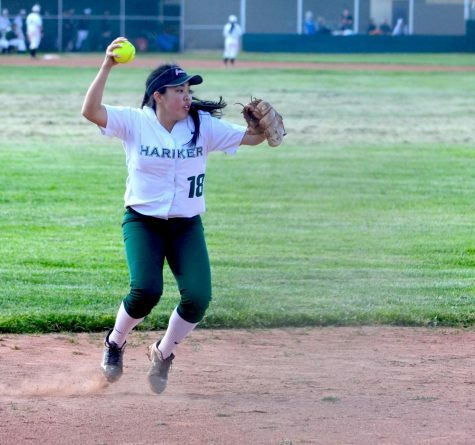 After a tough week for girls softball, the team now maintains a 1-3 league record after losing 11-10 to Pinewood on Tuesday and 14-2 to Notre Dame-Belmont on Thursday. Despite these losses, the girls are optimistic for the rest of the season as they approach their next home game against El Camino High School on Mar 19 at 4:00 p.m.